One of the biggest mistakes I think I've made with this layout (so far) is with my backdrop and fascia. While it won't be that big a problem elsewhere on the layout, in Wethersfield - an area that is relatively flat on the prototype - the backdrop is too high and the fascia is too low. Consequently, I have to either include an un-prototypically steep slope to cover/join everything together, or I somehow have to extend things. At this stage of construction, removing and redoing are decidedly not viable options. Note to self - and to anyone else at the construction stage of a layout: make sure your backdrop extends below your subroadbed and that your fascia extends above your subroadbed. Doing so will give you any flexibility you may need later. For those of you, like me, that have discovered you need a lower backdrop or a higher fascia to flatten out your topography, here's how I did it. . .
First step was to hot glue some masonite backers to the bottom of the backdrop, as above. Another tip: you may want also to include a strip along the bottom of the backdrop, linearly along the joint/seam. While the backers will help align things, I think a backing strip all along the joint would have been even better. Next, install your backdrop extension by butting the edge against the bottom of the backdrop and hot-gluing & clamping to the backers to hold it in place. You can see the result above - not too bad. The levels are there to show how (too) high the original backdrop was compared to the subroadbed - and to help me level things out for the installation of the rest of the support for Ballantine's and Wethersfield Lumber. Here's the foam board, installed. Jordan Lane will go between the ends of the sidings for Ballantine's (toward the back of the photo/"north") and Wethersfield Lumber (closer to you/"south") and head into the backdrop. Without the backdrop extension in place, Jordan Lane would have to go up a steep hill and would look awful. Here's a contemporary view of Jordan Lane, from trackside, looking west. 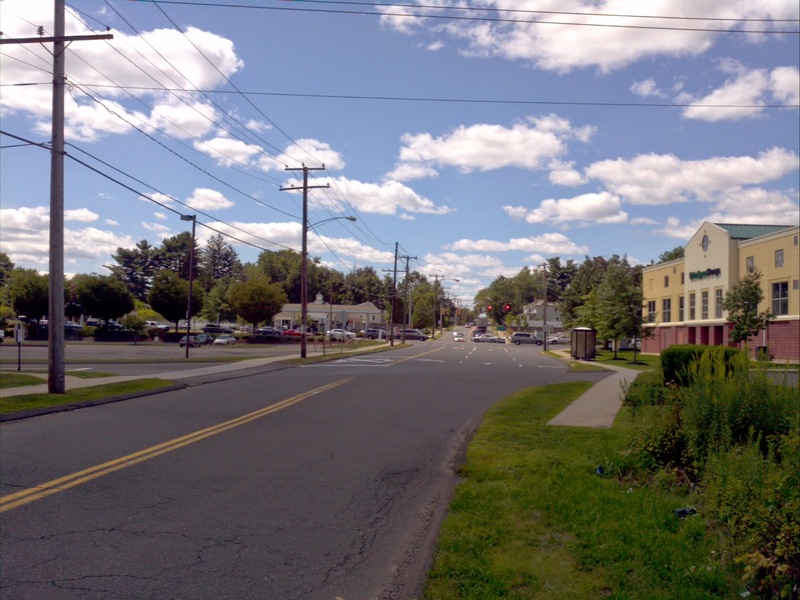 The building on the right is about where Ballantine's used to be and Wethersfield Lumber was on the left side of the street. While you can barely perceive a slight upslope in the distance, it's overwhelmingly flat here. As you travel south on the prototype, the topography gets a more pronounced slope from east (fascia) to west (backdrop) - which is helpful for my model. Consequently, I decided to end the backdrop extension just north of Church Street (which passes just south of the Wethersfield station). That foreground foamboard is the support for Gra-Rock Bottling, which sits just south of Church Street - and which, conveniently, has a bit of a hill behind it. Not quite as steep as what I'll need to do here, but not too bad. Here's the same area with some plastercloth and webbing done. The slope is really apparent here. That's a flat of the Gra-Rock building. Final view of the Jordan Lane area, looking southwest, showing the silicone caulk joint filler. I've since painted over this and it doesn't look great, but I'm planning on installing a photo backdrop over this entire seam to cover it up anyway. I needed to do this extension in order to provide a flat area for Church Street to come to the front/aisle. I'll need to do something similar for Jordan Lane and Wells Avenue/Middlesex Turnpike. This is what happens when you don't know enough to plan ahead of time where your streets are going to end up, and can cut your fascia accordingly. But, as you can see, all is not lost and this doesn't require that you redo the fascia entirely. I'm convinced (or at least hope) that once the scenery is in and the fascia is all painted that little "gotchas" like this will disappear - or at least not be so obvious to the operator. I include the above photo as an example of a taping/topping job gone horribly wrong. This is one of the joints/seams between two ends of masonite backdrop. Problem is, I totally forgot to use tape on the joint before topping. Then, instead of just taping & topping over it, I decided to try reopening the seam/joint and filling it with a bead of paintable latex silicone caulk. I used this technique with much success in the corners of a room in our old house that had cracking plaster walls. Took paint like a champ and looked great. Not so here. I don't know whether humidity was a factor, or if I didn't allow things to dry/cure long enough before re-painting, or what. But this is what I have currently. At least until I can figure out the best way to repair it. I'm afraid that might require me to scrape all this off and start over. 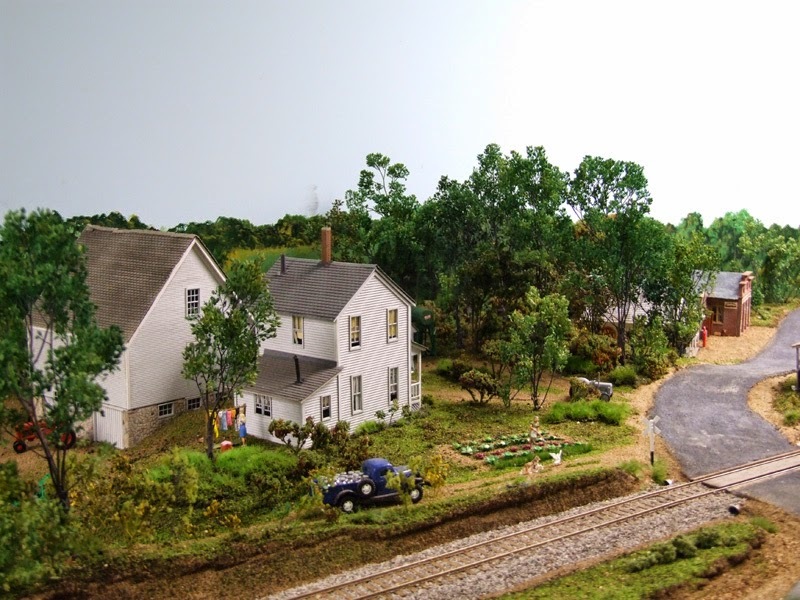 I would LOVE to be told that's not the case and that you have a better idea. . . .
Mark Olstyn and Marty McGuirk do scenery the way I hope to someday and the photo above is a great example of what I want my layout to look like eventually. It's also a great example of an alternative to extending the backdrop as I did. As you can see, it's a fairly flat scene and the backdrop isn't too far behind the track. But most importantly, the bottom 4"(?) or so of the backdrop can't be seen - it's obscured by trees and brush. Now, that may not work so well at the north end of Wethersfield at Jordan Lane, but it may be just the right approach for further south in town. So I'm considering ripping out the webbing and plastercloth from around Church Street/Gra-Rock and redoing the topography as here. The webbing would just go flat(tish) from the subroadbed toward the backdrop and then turn 90 degrees up to join the bottom of the backdrop. I'd cover it all with plastercloth and Sculptamold and paint the "vertical" webbing/cloth/sculptamold a dark green/brown color to provide a backing for the underbrush and trees. Of course, any thoughts/suggestions/feedback on any of this is always MOST welcome!